Other miscellaneous uses include furniture wrap and silage film. “Shrink film” refers to any film that requires the application of heat to shrink and seal around a product. Like stretch film, it finds use in both pallet unitization and packaging applications. Stretch and shrink film products include both primary and secondary packaging. Examples of secondary packaging include shrink collation films, and stretch and shrink labels. 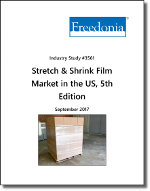 Demand for stretch and shrink films is examined by product, market, and resin type. Historical data for 2006, 2011, and 2016 and forecasts for 2021 are presented in current US dollars at the manufacturers’ level (which are not adjusted to account for inflation). Demand by resin is also presented in pounds.